After watching the third and final presidential debate on Monday night, I was disturbed to hear the two candidates talk about foreign policy with such lack of focus or context. Admittedly, Obama was intent on baiting Romney into a game-changing gaffe and Romney was intent on not committing any, such error. Presidential debates, ironically enough, are the last place to hear what a candidate actually thinks about any particular subject. Both candidates, for example, endorsed the comic notion that the Afghan Army will be able to take over the fight against the Taliban by 2014 as the precursor to an American retreat. Both candidates vowed that Iran will not be allowed to field a nuclear weapon (Romney actually drew the line at “nuclear capability” which is better), but neither one mentioned that the deeper problem with Iran is its current, Islamist government and not their pursuit of nuclear weapons per se. So, for instance, Romney seemed to accept the continuation of the Iranian Regime so long as it did not have nukes. The anti-American riots that have been rocking the Muslim world since 9/11 have shaken the establishment out of its complacency. Increasingly, even those who sympathize with the basic elements of the administration’s Middle East policy are connecting the dots. What they are seeing isn’t pretty. It’s not just that the US remains widely disliked and distrusted in the region. It’s not just that the radicals and the jihadis have demonstrated more political sophistication and a greater ability to organize and strike than expected and that the struggle against radical terror looks longer lasting and more dangerous than thought; it’s that the strategic underpinnings of the administration’s Middle East policy seem to be falling apart. A series of crises is sweeping through the region, and the US does not—at least not yet—seem to have a clue what to do. The Israeli-Palestinian problem, for example, cannot be settled quickly; the consequence of the region’s lack of democratic traditions and liberal institutions cannot be overcome in four or eight years; the underdevelopment and mass unemployment afflicting so many countries has no known cure; the ethnic and sectarian hatreds that poison the region will not soon be tamed; the deep sense of grievance and injustice that shapes the attitudes of so many toward the Christian or post-Christian West will not soon fade away; the radical and terror groups now roaming the region cannot be easily stopped or mollified; the resource curse will continue to corrupt and poison large parts of the region; the resurgence of Islam, even in less radical forms, inevitably heightens a sense of confrontation with the US and its western allies; and Iran’s ambitions are hard to tame and impossible to accept. Mr. Mead challenged both Obama and Mitt Romney to articulate a policy or at least initiatives that might address these problems. Neither has done so. At the risk of being what Mr. Mead terms “an armchair strategist” offering simple solutions, I believe that the U.S. needs to fundamentally reconsider its approach to foreign policy and the methods and tools used to pursue that policy. First, it is not enough, unfortunately, for the United States to be in favor of “democracy” or “freedom” for those around the world. These terms are simply too amorphous and chameleon to be useful in building a coherent foreign policy. Instead, the U.S. should be an ardent advocate for the foundations of civil society: respect for individual rights; free exercise of religion; freedom of speech; respect for the rule of law rather than resort to rioting and violence; the orderly transition of political power free from intimidation. This is a sampling of the bedrock, Anglo-American traditions that are prerequisites for a democratic republic. As Mark Levin argues in his latest book, Ameritopia, you cannot hope to have a real democracy without the foundations of a civil society. The Middle East is bereft of genuine democracies (with the notable exception of Israel) because it is bereft of the foundational traditions of a civil society. That is why it was unforgivably foolish of George W. Bush to insist on the hasty installation of a “democracy” in Afghanistan and Iraq. Neither of these societies had the foundations needed for democracy to take root. Yes, Iraq and Afghanistan may have the outer trappings of democracy with parliaments and elections, but form is not substance. Iraq is headed back towards civil war as the ethnic and sectarian factions escalate violence against one another. Afghanistan is a cardboard cut-out of democracy propped up with billions of dollars of U.S. aid and military assistance. Once the props are removed in 2014 (or sooner), the facade will collapse. So then, it is a tragic and self-defeating mistake for the U.S. to blindly push for elections. In Gaza, for example, such elections mean nothing. They mean less than nothing since they serve to legitimate blood-thirsty ideologues, putting the U.S. in the untenable position of undermining what we previously declared to be a “freely elected” government. No matter that said government throws its political opponents off of rooftops. Rather, the U.S. must be very specific, unapologetic and insistent about the type of democracy and “freedom” we are talking about– an Anglo-American civil society that can support the pressures of representative government and tolerate religious diversity and dissenting opinions. Furthermore, the U.S. must take a hard look at the nations as they are and not how we wish them to be. It took hundreds of years for civil traditions to develop in the West. It may take much longer in the Middle East, burdened as it is with Islamic notions of subjugation, subservience and nihilism. Out of fear of making the United States the issue in Egyptian politics, the Obama administration, like past administrations, has been too reticent about stating clearly the expectations that we and the democratic world have for Egyptian democracy: a sound constitution that protects the rights of all individuals, an open press, a free and vital opposition, an independent judiciary and a thriving civil society. President Obama owes it to the Egyptian people to stand up for these principles. Congress needs to support democracy in Egypt by providing aid that ensures it advances those principles and, therefore, U.S. interests. I would differ with Kagan to the extent that U.S. aid money is provided directly and up front to an Egyptian government that is showing every indication that it intends to implement its Islamist beliefs. Egyptians must see that voting in an Islamist government will have certain and severe consequences. In any event, the United States cannot be in the business of funding our enemies and, regardless of Kagan’s view that the Muslim Brotherhood is not clearly against us, a weak or failing Islamist regime in Egypt is better than one that is buying up the latest weapons systems (e.g., German submarines for example) with U.S. tax dollars. Kagan and those like him are desperate to see a civil society where none exists and, so, are easily taken in by democratic happy talk that Egyptian President Morsi (and other Islamists in the region) are all too adept at feeding to willing dupes. The second, radical change to U.S. foreign policy must be to view everything in terms of U.S. national interests and the tactics and lines of effort that best advance those interests. For example, for the better part of four years, the Obama Administration has confused the agenda of the United Nations with that of the United States of America. While it would be hoped that the international body that the U.S. founded at the end of World War II and funds disproportionately would be at least sympathetic to U.S. national interests, this is decidedly not the case. The U.N. has largely been subverted and overrun by authoritarian member states with interests that directly conflict with those of the U.S. In an ideal world, the U.S. would explicitly repudiate the U.N., evict it from its expensive quarters in Manhattan and rent out the space to a new organization made up of democratic U.S. allies. Alas, the best we can hope for is to limit the damage of the U.N. by ignoring it, working around it and forging coalitions of allies to negate the U.N.’s malign influence in the world. In the Middle East and around the globe, the U.S. needs to re-evaluate its position in the light of our national interest. We must, for example, reconsider our relationship with Saudi Arabia in light of their unrelenting funding of Salafist and Wahhabist ideologies directly hostile to the U.S. and the West in general. We cannot elevate the Saudis to the high status of ally or even “friend” when they are bankrolling our enemies. This need not mean open conflict with them, but it surely must mean a reduction in relations. (The fact that the U.S. is set to soon surpass the Saudis as the world’s largest oil producer should translate into tangible, state leverage). Syria is another example where the U.S. must evaluate the opportunities and risks for involvement based primarily upon national interest rather than the threat of a “humanitarian crisis” or “instability.” Even a Syria riven by civil war and instability will stalemate Iran’s ability to fund and support Hezbollah and bring greater opportunities for U.S. influence in the region as a whole. The U.S. has been at war with Iran since 1979 and rarely have we had an opportunity to deal the regime in Tehran such a critical blow as exists in Syria. Throughout the Middle East U.S. policy is plagued by a lack of a driving force. The U.S. intervened in Libya under the pretext of potential civilian casualties but recoils from Syria with actual casualties. The U.S. dithers over supporting former President Mubarak in Egypt while supporting the no-less tyrannical Saudi royal family. The U.S. spends tens of billions of dollars on a corrupt government in Kabul but argues whether to pull funding from Israel if it does not halt new housing settlements or show enough “flexibility” on Arab demands for land. It is high time to clarify who our friends and enemies are and why. Israel is not merely a kindred democracy, for example. They are a vital ally because they directly serve U.S. interests in the region as a bulwark against Islamists. There is, perhaps, no greater return on U.S. investments than Israel given the plethora of hostile, Islamist states in the region. But here again, the U.S. policy is to adopt the hectoring, self-righteous tone of the international community, treating Israel and the Palestinians on equal terms for no good reason. It is my hope that Mitt Romney wins the election and does so in convincing fashion. The next four years could be pivotal as a showdown with Iran cannot be delayed beyond the next term in office. War is everywhere in the Middle East and the next President will need to have a clear-eyed view of what America’s interests are and how to achieve them. The last 11 years have certainly taught us that “nation building” and “elections” are not effective tools of American power. May President Romney absorb the lessons and chart a better course in 2013. This opinion piece seems almost too good to be true. Former Saudi ambassador and Saudi intelligence director Turki al-Faisal writes in The New York Times op-ed page (on September 11th no less!) that a United States veto in the U.N. of an anticipated proposal for a “Palestinian” state could result in the loss of Saudi Arabia as an ally in the Middle East as well as other unpleasantness. There are so many great come-backs here, I am just going to list them and let readers vote in the comments section on the one that best summarizes their feelings (or suggest their own). Lose Saudi Arabia as an ally if we veto a Palestinian State? A) Can we get that in writing? B) We should be so lucky. C) So… what’s the bad news? D) Is that a threat or a promise? E) Wait, you mean to say that Saudi Arabia has been our ally all this time? F) With allies like this, who needs enemies? Al-Faisal’s piece is such a target-rich environment that it is almost too easy. Where to begin? How about his argument that failure to support the creation of yet another terror-supporting State by the name of “Palestine” (a term, by the way, that was only revived by the British colonial rulers in 1917 and was never appropriated by the locals until after the revival of Israel in 1948) will further undermine Israel’s security? Sure, it is possible that the veto of the resolution might lead to yet another intifada (as al-Faisal warns), but this sort of talk sounds like the practiced art of an extortionist: Sure would be a shame if you didn’t go along with the new, palestinian state and then something happened to your family. (Come to think of it, this talk sounds like the kind of thing we hear from labor unions these days. I wonder if al-Faisal has been reading the SEIU manual?). At any rate, it is difficult to imagine that Israel’s security could get much worse short of open warfare. Afterall, Israel is already getting rocketed from the Gaza Strip, infiltrated by terrorists from the supposedly demilitarized Sinai peninsula, the aim point for tens of thousands of medium range, Hezbollah missiles in southern Lebanon and literally ringed by neighbors who are all committed to her annihilation. Other than that, it’s all just peachy, eh Mr. Faisal? I also like the bit about the border of the State of Palestine being based upon the pre-1967 War borders. Now where do you think al-Faisal got that idea? Yeah, thanks Barack Hussein. Last time I checked, the 1967 borders were about the width of the Washington, D.C. beltway and utterly indefensible. Saudi Arabia would no longer be able to cooperate with America in the same way it historically has. With most of the Arab world in upheaval, the “special relationship” between Saudi Arabia and the United States would increasingly be seen as toxic by the vast majority of Arabs and Muslims, who demand justice for the Palestinian people. Again, the Saudi idea of “cooperation” is funding Sunni terrorists in Iraq who target Americans, spending billions of dollars on Islamic schools all over the world (including the U.S.) which teach militant Wahhabi doctrines, spending billions more supporting mosques and imams who preach violent jihad against the U.S. and actively seeking to undermine democratic institutions in the U.S.
Saudi leaders would be forced by domestic and regional pressures to adopt a far more independent and assertive foreign policy. Like our recent military support for Bahrain’s monarchy, which America opposed, Saudi Arabia would pursue other policies at odds with those of the United States, including opposing the government of Prime Minister Nuri al-Maliki in Iraq and refusing to open an embassy there despite American pressure to do so. The Saudi government might part ways with Washington in Afghanistan and Yemen as well. A “far more independent and assertive foreign policy” ? Example Bahrain? Assuming that the Obama Administration was sincere in its public protests over the tanks and troops sent by Saudi Arabia into Bahrain to quell Iranian-inspired protests, the last thing that any thinking American wanted was another, major oil producing state in civil war. Go ahead and send in tanks, O Sultan. And “opposing the government of…al-Maliki” in Iraq? Puh-leeeze. The U.S. can barely stand the guy either. He is leading his country down the tubes with the Iranians. Very few people in the U.S. would mourn the loss of Maliki. The U.S. gave him a perfect opportunity to establish a strong and independent Iraq and he blew it with a short-sighted Status of Forces Agreement in 2008 that gives away Iraqi security at the end of this year. Does the Obama administration care that the Saudis will not establish an embassy in Iraq? That’s good. No one else here does. A Saudi embassy is just another, little piece of hell on earth for women, infidels and those who love bacon. In fact, in case you have not noticed, Al, Americans are none too happy with Obama these days, so making threats of non-cooperation with Obama’s foreign policy is actually a way to get drafted by Democrats to run against Obama for re-election in 2012. (And, considering how Democrats these days seem to love authoritarians– see the Tom Friedman man crush for China’s communist leadership– a Saudi candidate might just be their dream guy). At the end of the day, Saudi Arabia naturally pursues its own, national interests and does not shrink from doing so even when it involves the death of U.S. servicemembers (as TCJ pointed out in the past with regard to its role in supporting Sunni terrorism in Iraq, for instance). It is comic, however, when someone like al-Faisal tries to pretend that the Saudis are America’s closest ally in the Middle East and the damage (or even loss) of that relationship is something that most Americans would grieve over. No matter how they dress it up, the notion of a state for the Arabs that formerly resided in Israel (aka “Palestinians”) is simply a cynical means to the ultimate end that they desire: the obliteration of Israel. The Amphibious Dock USS San Antonio has something to teach us about Iran and its intentions. But before learning from the USS San Antonio, a framework must be constructed within which to view this information. David Ignatius authored an article for the Washington Post on the A-Team for Iran. Ignatius likes Zbigniew Brzezinski and Brent Scowcroft because of their ability to help American foreign policy “turn a page,” so to speak. Ignatius asks the two how they would begin negotiations with Iran. The obvious but unstated presupposition is that Iran is pursuing a nuclear program, and indeed, behaves as it does, because of its fear and need for survival, or in their own words, “mutual security” in a dangerous region. That no nation has threatened them, and that no nation in the region would even be able seriously to threaten them, doesn’t weigh in on the axiom. It is simply irreducible, the notion that Iran would live in peace with its neighbors if only it could assure its own security. All mathematics and in fact all philosophy begins with presuppositions, propositions that are unproven because they cannot be proven. But the investigation doesn’t end here. When a system of thought based on these presuppositions yields conclusions, results, observations and consequences that are radically inconsistent with what would be expected given the presuppositions, then something is wrong with the starting point. Under these conditions, one must be willing to relinquish his presuppositions. That Iranian weapons, special groups, IRG, Quds and other rogue forces supported by Iran (Ansar al Sunna) created havoc inside of Iraq hasn’t been enough to convince the two A-Team members that Iran doesn’t intend on having peace in the region. Neither, for that matter, does the fact that General Petraeus had to appeal to Iranian General Qassem Suleimani to stop the shelling of the Green Zone in the summer of 2008 (at which point it stopped) convince the A-Team that their ideas of a docile Persia just may not be panning out. But this unwillingness to revisit presuppositions isn’t baggage carried by the Arab states. In fact, the Arab states never started with these ideas. They are uniquely Western. With Iran’s push towards going nuclear, the balance of the Middle East is thinking the same way, and not because they need the energy. The outstanding Middle East journalist Michael Totten has an important article on how the Sunni Arabs see Iran, and the role Israel is playing in regional resistance. Most Arab governments, aside from Syria’s and possibly Qatar’s, are far more worried about Iranian regional dominance than they are about anything coming out of Tel Aviv or Jerusalem. They know perfectly well that the State of Israel is not going to undermine or overthrow them, while radical Iranian-sponsored Islamists just might. Egypt and Saudi Arabia are threatening Iran with a nuclear arms race. Surely they weren’t happy when Israel developed nuclear weapons, but they never retaliated with programs of their own. Bombastic anti-Zionist rhetoric to the contrary, they know Israel isn’t really a threat. Nor are they a serious threat to Israel anymore. While the Arab states fear for their very existence, the A-Team wants to convince the radical Mullahs that they aren’t in any danger. They wish to tell the regime that it doesn’t need nuclear weapons for its defense, while the regime has flatly told them that negotiations and dialogue will only succeed if the U.S. accepts the Iranian nuclear program. It isn’t just the evidence of Iraq, Hezbollah, Hamas, trouble in Iraq, and threats against the state of Israel that is available to convince the A-Team that they must revisit their fundamental axioms about Iran. In fact, it’s not even the conservatives in America (who have mostly given up). The Iranian regime itself is trying to convince the U.S. that what they believe about Iran is fundamentally wrong by dictating a starting point for negotiations that ensures that the end game is diametrically opposed to what the U.S. wishes. And now to the USS San Antonio. 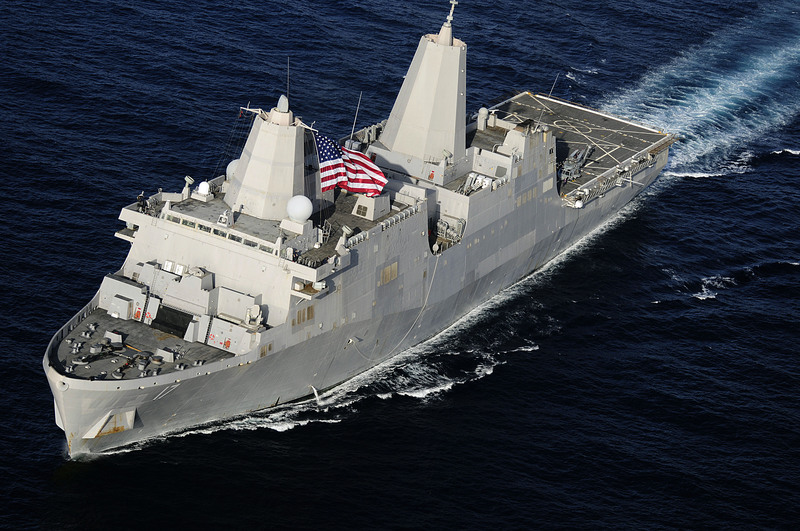 The U.S. Navy has assigned an amphibious transport dock ship, the USS San Antonio, to track Iranian weapons shipments to the Gaza Strip. Officials said the San Antonio, flagship of Combined Task Force 151, intercepted and searched an Iranian-owned cargo ship in mid-January found to contain artillery, missiles and rockets. The ship was released and expected to arrive in Syria on Jan. 28. Adm. Michael Mullen, the chairman of the U.S. Joint Chiefs of Staff, said the weapons ship intercepted in the Red Sea was determined to have been destined for Syria, a leading supplier of Hamas and Hizbullah. Mullen said the United States could not legally hold the Cypriot-flagged ship, owned by Iran. “The United States did as much as we could do legally,” Mullen told a briefing on Jan. 27. We learn many things about our own struggle with lawfare versus warfare with this example. But saving this for another time, the U.S. has interdicted a ship bound for Syria with artillery, missiles and rockets. Whether these weapons end up with Hezbollah or Hamas is not relevant. They will end up destabilizing the region over nation-states which are not a threat to its own existence. The weapons will end up contributing to the regional hegemony that Iran has pursued for twenty five years. While the A-Team is confused about presuppositions, they don’t hold the exclusive right to dreary stubbornness regarding Persian intentions. This has been going on for twenty five years now, and thus, the same page that has been read for twenty five years is being recited once again. “The enemy must not know where I intend to give battle. For if he does not know where I intend to give battle he must prepare in a great many places. And when he prepares in a great many places, those I have to fight in any one place will be few,” Sun Tzu, The Art of War, VI.14. “He who intimidates his neighbors does so by inflicting injury upon them,” Sun Tzu, The Art of War, VIII.14. At the moment, the enemies of the United States are fighting us within the borders of Iraq. It is a global war, but it has been confined by U.S. policy strictly to the contiguous Iraqi territory. It has been noted that although talks occurred between Iran and the U.S. over Iraq and the U.S. position has been made abundantly clear, rather than a reduction in Iranian influence, there has been a marked increase in Iranian influence and activity within Iraq. [Maj. Gen. Rick] Lynch said he gave the order on Wednesday for the division’s 3rd Combat Aviation Brigade to begin Marne Husky — the latest in a series of offensives in the capital and surrounding areas. The new operation is aimed at disrupting insurgents who fled a recent crackdown on the rural areas of Arab Jubour and Salman Pak in a predominantly Sunni area south of the capital. Lynch also noted a “marked and increasing Iranian influence” in weapons and the training of Shiite extremists in restive areas south of Baghdad. The presence and role of Saudi Arabia in Iraq (while the U.S. has been reluctant to admit it) has also been noted by the administration. Bush administration officials are voicing increasing anger at what they say has been Saudi Arabia’s counterproductive role in the Iraq war. They say that beyond regarding Mr. Maliki as an Iranian agent, the Saudis have offered financial support to Sunni groups in Iraq. Of an estimated 60 to 80 foreign fighters who enter Iraq each month, American military and intelligence officials say that nearly half are coming from Saudi Arabia and that the Saudis have not done enough to stem the flow. We have discussed the fact that organizations (not necessarily associated with al Qaeda) in Syria sell suicide bombers and foreign fighters across the Syrian border to the insurgency in Iraq. These borders serve as a sieve for not just Saudi or Syrian fighters. On July 31, 2007, sixty six Pakistani nationals were arrested in Karbala using forged visas. The influx of suicide bombers from countries around the world is well known (Saudi Arabia (53), Iraq (18), Italy (8), Syria (8), Kuwait (7), Jordan (4), Libya (3), Egypt (3), Tunisia (3), Turkey (3), Belgium (2), France (2), Spain (2), Yemen (3), Lebanon (1), Morocco (1), Britain (1), Bengal (1), Sudan (1) and Unknown (18), and this list is likely short on bombers from Morocco). Iraq has a long border: 1458 km with Iran, 181 km with Jordan, 814 km with Saudi Arabia, 240 km with Kuwait, 605 km with Syria, and 352 km with Turkey (some sources have slightly different values). Leaking borders has been a problem since the start of Operation Iraqi Freedom, and three years ago Iraq was “calling on” Iran and Syria to help seal the borders. How does a country with such porous and long borders seal them? More than a year ago Saudi Arabia invited bids for the construction of a fence along its border with Iraq. And while this is interesting (and may ultimately succeed to slow the flow of terrorists across the border), it is not the immediate solution needed, while also possibly pointing the way forward. The solution is not for Iraq to seal the borders. The solution involves intimidation of Iraq’s neighbors into sealing the borders. While the U.S. and Iraq are involved in talks with Iran and other neighbors, tried and tested military strategy suggests that bullying is the order of the day. This bullying and intimidation might take the form of financial pressure (or conversely rewards for good behavior), market sanctions, air assets used against foreign fighters flowing in from across the borders, small incursions across the borders to destroy the sanctuaries of foreign fighters, or even larger air power involvement to destroy those sanctuaries and other supporting infrastructure. The alternative is leaving these sanctuaries and flow paths in place, with no hope of the Iraqi security forces or U.S. forces being able to stop them (due to force size). Tested military strategy aims for the right target. In the case of the borders, the target is the offending country, not the Iraqi border proper. At the moment, the offending countries know that U.S. forces have restricted the battle space to Iraq proper. Either this changes — causing confusion and disaggregation among the foreign elements who wish to destabilize Iraq — or the borders will remain porous.